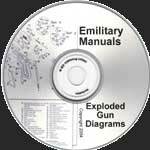 This download has over 220 exploded gun diagrams with accompanying parts list. These diagrams are great for assembly and disassembly of many guns. Very useful for gunsmiths.